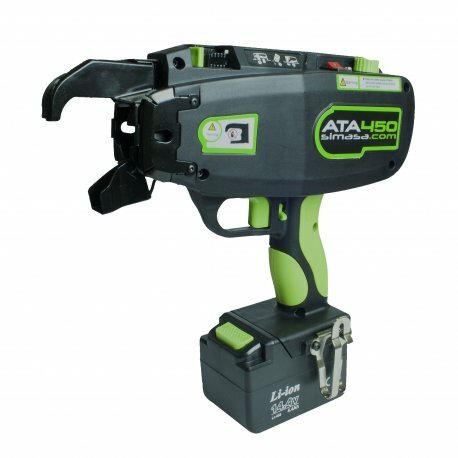 SIMA ATA 400 Rebar Tier: Max. Tying Speed: 0.8 secs/tie; Battery type: LI-ION; Ties per Coil (2 wraps): 160 ties; Max Tying: 45 mm. Compatible with SIMA and MAX coils along with mostother brands. Shop online with free shipping and returns on rebar tiers in the UK. The SIMA ATA 400 rebar tier makes rebar tying incredibly fast and easy compared to manual tying. With maximum performance and high operating speed, the electric SIMA ATA 400 works 5 times faster than manual rebar tying, with each tie taking less than one second. This rebar tier is comfortable to use thanks to its compact, lightweight design, which allows you to easily operate it with just one hand. It is made with an ABS hard impact frame and body and ergonomic handle with rubber for a firm grip while tying. SIMA ATA 400 electric rebar tiers also have a tying selector for 2 or 3 wraps and 5 different levels of tying strength, and are able to tie rebar and structures, rebar mesh, metal / rebar grids, etc. It is very efficient thanks to its high tying torque, saving wire coils as it requires less quantity of tying shots (approx. 30% savings). Its excellent working life per battery charge helps get the job done quickly without stopping to recharge the battery constantly thanks to its 14.4V (3Ah.) lithium ion quick-charge battery. Its amperage increases operational working life: up to 2200 ties per battery charge, approximately. Troubleshooting any issues with the SIMA ATA 400 rebar tier is simple because it is designed with high tech inner electronics with a warning system for auto-diagnosis. It also features a trigger lock for safety while not in use. When it comes to rebar processing, SIMA offers quality products you can trust. Shop online for SIMA ATA 400 with free shipping and returns on rebar tiers to the UK. High operational speed. It works 5 times faster than traditional manual rebar tying, less than a second per tie. It runs on a 14.4V (3Ah.) Lithium-Ion quick-charge battery. Its amperage increases operational working life: up to 2200 ties approx. High technology inner electronics with beeps warning system for auto-diagnosis. Higher tying torque than other competitor's models, so it saves wire coils as it requires less quantity of tying shots (approx. 30% save). Suitable for most of wire coils available in the market, can use SIMA and most brands’ coils. Featured with trigger lock for safety.